April 12th, 2019: The Day of Silence. This is something that happens internationally, but this year it came to Avonworth. The Day of Silence is a day in which many students remain silent. Students choose to remain silent throughout the day to bring attention to the silence faced by lesbian, gay, bisexual, and transgender people and their allies. LGBT+ people may be forced to remain silent because of anti-LGBT bullying, name-calling, and harassment. Students at Avonworth have chosen to remain silent today for a myriad of reasons. One student wrote that she chose to remain silent because she identifies as bisexual, however, her parents are not supportive of the community so she fears that she will never be able to come out to them. The Day of Silence is her way of spreading awareness that some people can not say anything about their identities, or when they do they are punished for it. 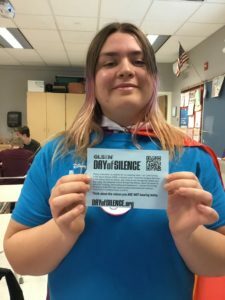 Others took up the Day of Silence because they publicly identify with the LGBTQ+ community and want to show their support for those who cannot be public about who they are and what they feel. Junior Toni Keller proudly participated in the Day of Silence displaying her information slip as well as sporting her pansexual pride flag as a cape. Whether they can not come out themselves, or they are supporting those who can not, students at Avonworth are showing their support for the LGBTQ+ community through the Day of Silence and raising awareness of an issue that can be stopped if we try.